Location: A large realm built up around the Havens of Umbar; originally built by the Black Númenóreans, it changed hands many times. 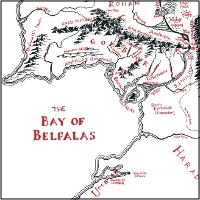 The Bay of Belfalas, showing Umbar and its environs. The great cape and land-locked firth of Umbar had been Númenórean land since days of old; but it was a stronghold of the King's Men, who were afterwards called the Black Númenóreans, corrupted by Sauron, and who hated above all the followers of Elendil. After the fall of Sauron their race swiftly dwindled or became merged with the Men of Middle-earth, but they inherited without lessening their hatred of Gondor. ... Umbar, where was the mighty haven of the Númenóreans that no hand had wrought. Umbar... became a great harbour and fortress of the power of Gondor. In [Hyarmendacil's] day Gondor reached the summit of its power. The realm then extended... south to the River Harnen, and thence along the coast to the peninsula and haven of Umbar. [The Haradrim] contested the designs of Gondor to occupy the coast-lands beyond R. Harnen; they therefore tried to take Umbar, where Gondor maintained a great fort and haven. 2280 Umbar is made into a great fortress of Númenor. 3261 Ar-Pharazôn sets sail and lands at Umbar. 933 King Eärnil I takes Umbar, which becomes a fortress of Gondor. 1015 King Ciryandil slain in the siege of Umbar, but Gondor's navy and the strength of the fortress prevent it's being taken. 1050 Hyarmendacil conquers Harad. Umbar is no longer menaced. 1448 The Kin-strife. Castamir having been slain by Eldacar, his sons escape with many followers and ships and seize Umbar. There they made a refuge for all the enemies of the king, and a lordship independent of his crown. 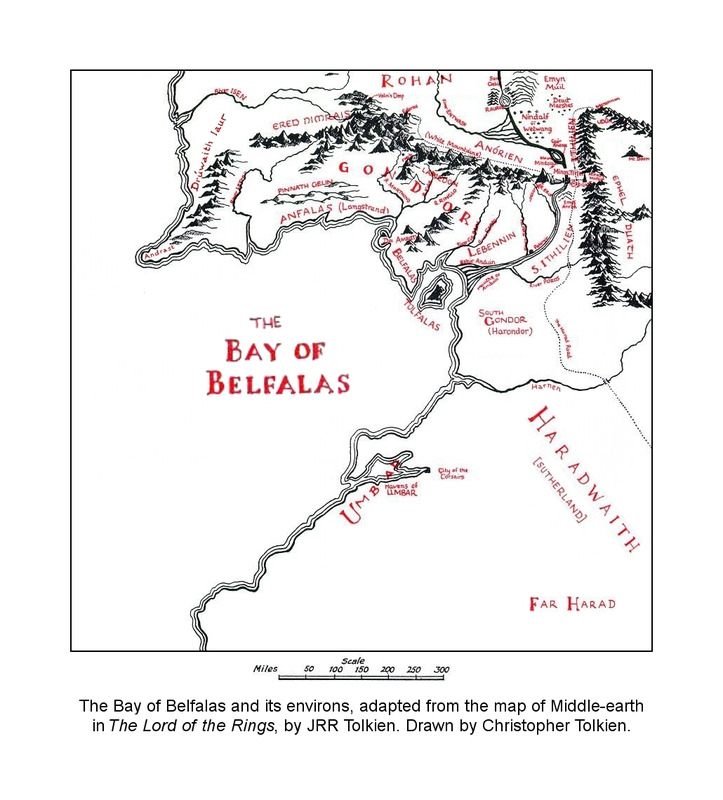 Umbar remained at war with Gondor for many lives of men, a threat to its coastlands and to all traffic on the sea. 1540 King Aldamir slain in war with the Harad and Corsairs of Umbar. 1810 King Telumehtar Umbardacil retakes Umbar and drives out the Corsairs. 1856 After the battles with the Wainriders, Gondor withdraws from all eastern lands except Ithilien. Umbar was again lost. 2758 Fleets from Umbar and Harad attack the coasts of Gondor, with landings as far north as the mouth of the Isen. 2980 Aragorn, as Thorongil, burns the ships of the Corsairs at the Havens of Umbar. 3019 Aragorn captures the fleet of the Corsairs at Pelargir.